13:04 – Black Watch is currently 232 nautical miles north east of San Miguel in Azores. We’ve sailed 1082 nautical miles since leaving Southampton and we should be alongside in Ponta Delgada at 10:30AM tomorrow morning – ahead of schedule. Currently sailing at 12.5knts. More importantly, all pools will be filled tomorrow! 10:03 – At sea today. Surrounded by low pressure. 13:06 – We have sailed 672 nautical miles since leaving southampton. Currently at 16.5knts – half way to ponta Delgarda with 673 nm to go. On board Fred.Olsen Cruise Line’s Black Watch. Steak and seafood specialty restaurant. 11:02 – Our current location. It’s quite choppy today but passengers are enjoying it and getting ready for the morning quiz. 16:13 – Since leaving Southampton until noon today we’ve sailed 242 nautical miles. You’re going to be hearing a lot from me over the coming months, so I thought I should take a moment to introduce myself. Hello! I’m Danielle, a cruise blogger better known to my readers as Cruise Miss. 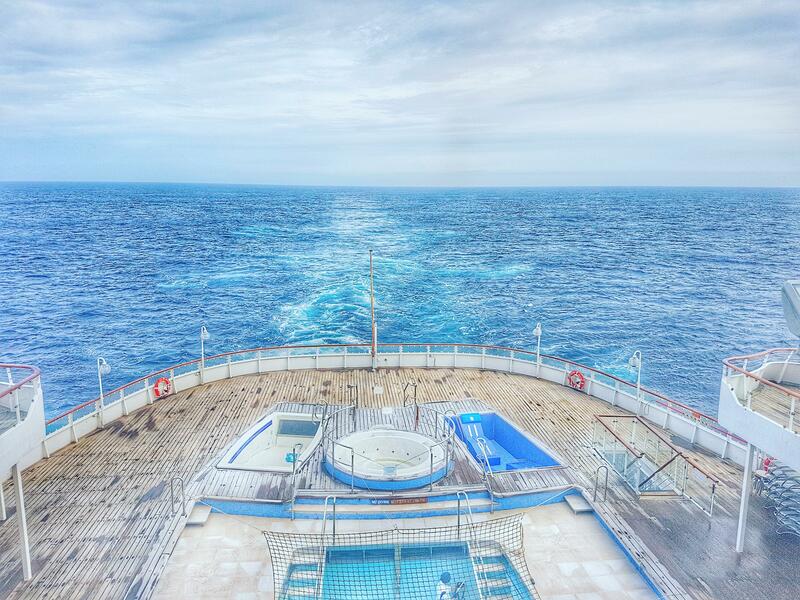 I started blogging in 2012 and since then, I’ve spent a considerable amount of time at sea. I’ve visited some fascinating places and spent time aboard some stunning ships, but I’m about to begin a journey that even now, I still can’t quite believe is happening. Tomorrow morning, I will leave my home in Newcastle and make my way to Southampton, where I’ll be joining Fred. Olsen Cruise Lines’ ‘Black Watch’ for her 108-night WORLD CRUISE. During the sailing, Black Watch will visit more than 20 countries on six continents and offer destinations that I thought I’d only ever dream of, including Cuba, Bora Bora, Hamilton Island, Singapore, Yangon and India. As this is going to be a once-in-a-lifetime experience, I want to share it with as many people as possible, so I’m going to take you with me, virtually. Throughout the cruise, I’ll be sharing pictures, videos and daily updates on where the ship is, what has been happening onboard, what I have been doing ashore and most importantly, whether I managed to win a quiz! You can follow me via Facebook, Twitter and Instagram with World of Cruising and of course, via Cruise Miss.